Brambles Bed and Breakfast - Tiverton - Reviews - 20130315 - Peaceful 2-night stay for 2 - would recommend! Brambles Bed and Breakfast - Tiverton - Review - 20130315. Peaceful 2-night stay for 2 - would recommend! We had a lovely break at 'Brambles'... it was very 'Brambly Hedge'! Our hostess, was welcoming and just like Mrs Tiggy Winkle (but without the pinafore) in all the best ways! We had a lovely, double aspect, four-poster 'Amber' room with far-reaching views. Although we were close to the motor way the only 'noise' we heard was bird-song and a slightly rattly radiator (which we turned down to resolve the problem) and we were still warm enough, despite the wintry weather. Our room had a private bathroom. Everything was in good working order except I couldn't adjust the mixer for the shower over the bath... but that may just have been 'me'! Despite being at a budget price, the stay was comfortable and everything looked spotlessly clean. We would definitely consider staying here again and would recommend it to friends. The amber room was lovely! Good, clean, well priced and convenient. I really enjoyed my stay and it was faultless. The room was very comfortable indeed and had everything that was required. The owner was very friendly and accommodating. If I'm in the area I'll be back. Warm friendly welcome. Everything about the room was excellent. Just what we needed. The recommendation of the local pub for dinner was perfect. One day we will return. Bedroom was great, nice and warm. TV was put on for us and the kettle had been boiled for us. Plenty of tea coffee and biscuits for us. Breakfast was very nice, there also was fruit to go with cereals. Ticked all the boxes! A quiet warm and comfortable room and a lovely breakfast on our journey westwards. A lovely hot bath and peaceful surroundings. Good instructions from the M5 even in the dark! Lovely in every way. Thank you for everything. We had a really nice stay and really want to come again. The omelette with cheese was awesome. The lovely rooms, the best facilities and the whole ambience. For those guests who have a preference for a bath, we have one room with a private bathroom (bath tub). We also have en-suite rooms, all with showers. 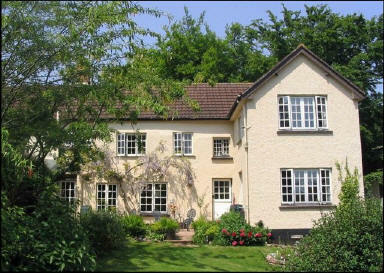 Brambles Bed and Breakfast, Tiverton.